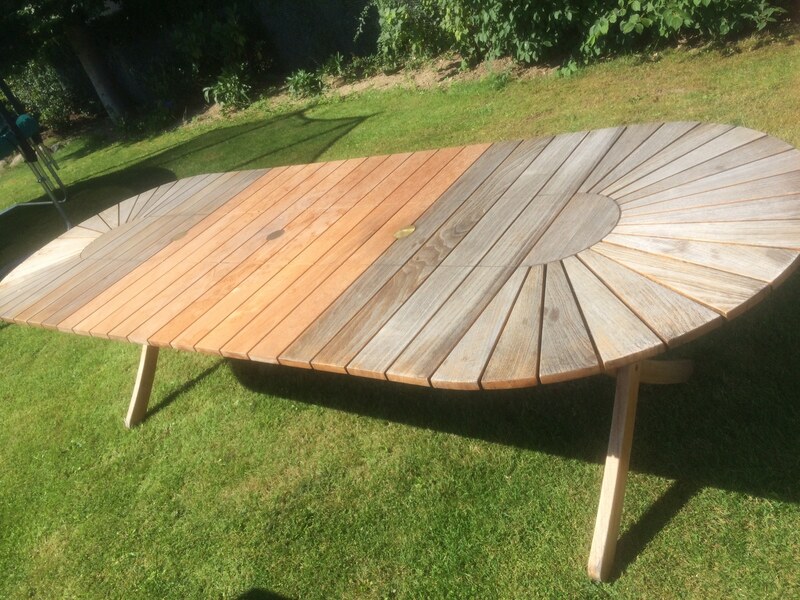 We have recently received some wonderful pictures from a customer who had a very sad looking greyed garden table. Luckily they contacted us and we helped them decide on the best products to use to help restore their table. As you can see, the wood has become dull and grey from weathering caused by mildew, pollution and UV rays. So what did we recommend they use to restore the table? As the table had a previous coating, this needed to be removed before the customer applied their desired finish. This is because Teak-Olje is a penetrating oil that works by nourishing the wood from the inside out. It doesn’t sit on the surface, so old coatings must be removed to get the best finish possible. Prepdeck is our external wood stripper and cleaner. It is a high-grade product specially designed for the removing of old solid and semi transparent stains, unsightly grade stamps and other finishes. To strip away previous finishes, you use Prepdeck undiluted straight onto the surface of the wood. After appropriate time (approximately 15 – 30 minutes), test a small area with nylon scrubbing brush to see if the finish is lifting. If it is, scrub the area with a stiff nylon brush, or alternatively, use a Power Washer at 1000-1500 psi (70-103 bars). The psi is dependent on your type of wood. Always work in direction of the grain. Then, simply rinse with copious amounts of fresh water, using the highest pressure from the water source available. If you are using a Power Washer, set it to 500-1000 psi (35-70 bars) working in direction of grain. (Rinse adjacent areas at same time). Once the previous coating has been stripped away, the wood then needs to be neutralized. Net-Trol is our powerful wood cleaner and brightener which restores greyed and weathered wood back to its natural color without damaging the wood’s fibers. To apply Net-Trol to neutralize, you must first wet the surface thoroughly before hand. Then, with a synthetic brush or roller, apply the Net-Trol to the wood and then scrub with a stiff nylon brush. Then just simply leave the Net-Trol to work (approximately 10 – 20 minutes). If the surface starts to dry you must dampen it with a mist application of water. Do not allow the Net-Trol to dry out. Once the Net-Trol has sat for the required amount of time, simply scrub the surface whilst rinsing with water. Alternatively, use a pressure washer (max. 60 bar). If required, repeat the procedure. Once your wood has been stripped and neutralized, you must now let it dry for 48 hours before using your chosen finish. 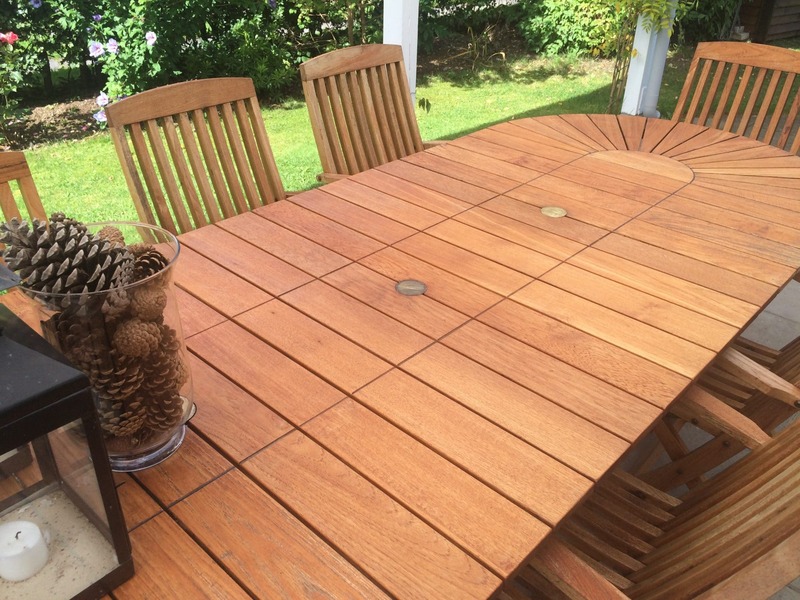 Teak-Olje is our deep penetrating, clear oil that gives a rich warm appearance to any treated wood surface. 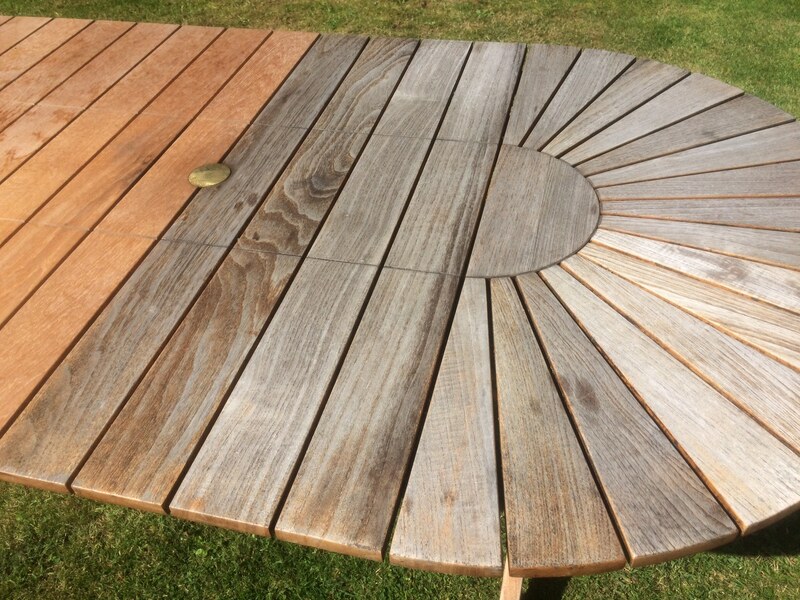 It replaces the natural oils lost by exterior wood in the weathering process and will not blacken when exposed to UV rays making it ideal for garden furniture. To apply, brush on 2 even coats of Teak-Olje, ‘wet-on-wet’. To do this, first apply the initial coat and allow it to penetrate into the surface (this normally takes around 15-30 minutes). After the first coat has fully penetrated into the surface, apply the second coat and allow this to penetrate too. If necessary, apply more coats following the same process until the wood is fully ‘saturated’ and will take no more oil. You must now allow the Teak-Olje to become touch dry between applications, so we recommend you work in smaller sections for larger projects to ensure this. 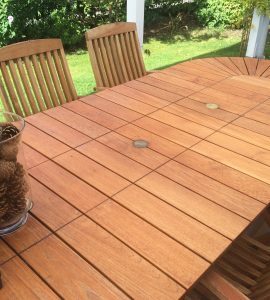 Brush out or wipe up any excess Teak-Olje with a lint-free cloth 15-20 minutes after the last application to avoid shiny spots. 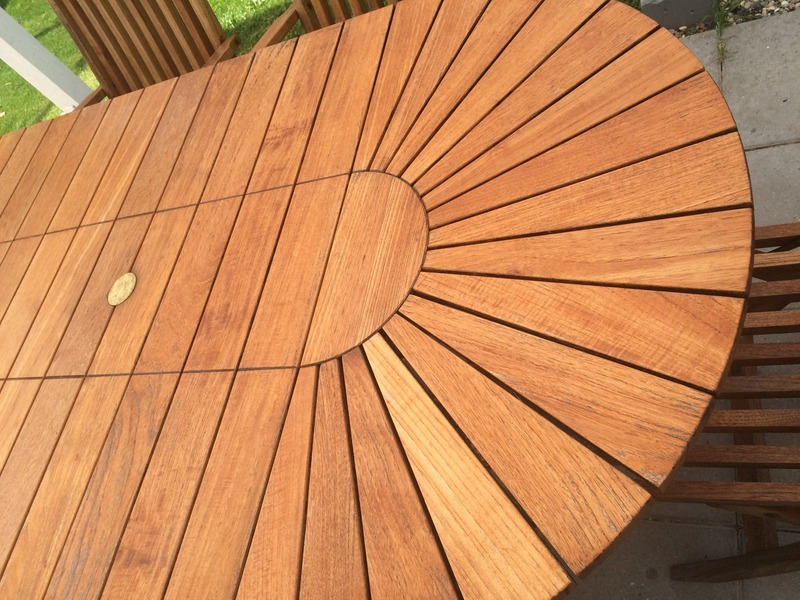 Remember, Teak-Olje is not a surface coating, its place is inside the wood and not on the surface. Teak-Olje protects by penetrating the wood, providing a rich, matt finish. Take a look at that beautiful warm finish! We think it came out looking fantastic – What do you think? For more information about Teak Olje, please click here.